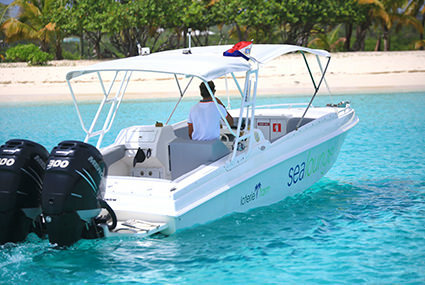 Explore and uncover the most stunning coastal locations on this 6-hour powerboat and snorkeling excursion around St Maarten (Dutch side) and St Martin (French side). 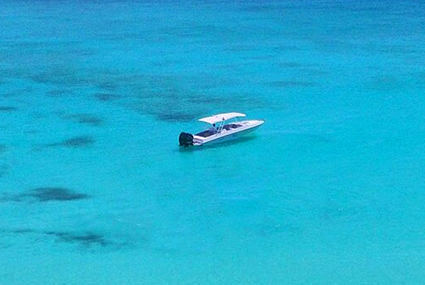 A professional captain will personally navigate your speedboat around various island hotspots and untouched areas. Snorkel the finest nature reserve locations such as Tintamarre Island and Creole Rock. Indulge in an included lunch while witnessing enormous aircraft fly inches overhead onto princess Juliana Airport at Maho Beach. An all inclusive open bar is available onboard as well as full use of snorkeling gear. Begin your tour at one of the three marinas (listed in departure times), where you will meet with your friendly captain and crew. Once everyone has checked in and made their way onboard, your captain will give a short briefing about your speedboat, general safety and overview of the day. Shortly after your departure, you will come into Simpson Bay Bridge and enter the largest lagoon in the Caribbean. Here you can marvel at some of the most iconic and impressive mega yachts in the world all lined inside the lagoon. Exit out the French side at Sandy Ground bridge and out to the open Caribbean Sea. The first stop will be Creole Rock. An amazing rock formation that sits a quarter mile off shore from Grand Case Beach. Grab a pair of fins and a mask to explore the rich underwater life on one of the islands best snorkeling locations, filled with tropical fish and an abundance of colorful coral. From there a short 15-minute cruise awaits around the very north point of St Martin to the uninhabited island of Tintamarre. Here you can relax on the soft white sandy beach or snorkel in the protected marine reserve and experience sea turtles and other tropical sealife in their natural habitat. 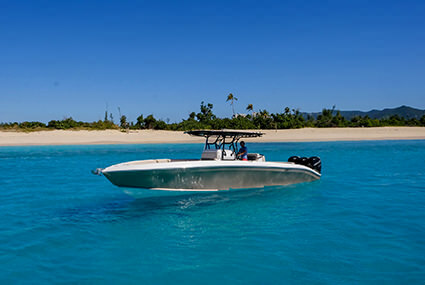 Leaving Tintamarre, your captain will take you for a short ride over to the small but vibrant Pinel Island. This is a great spot to hangout in shallow calm waters or to get a refreshing cocktail at one of 2 popular beach restaurants. It can also be fun to pay a visit to the big schools of Iguanas and feed them. Next is lunch where you will dine on either Pinel Island or Grand Case Beach. Both offer delicious French/Caribbean cuisine restaurants and provide stunning views of the island. There will be a choice of 4 fresh dishes and also a tasty option for our vegetarian guests. This is included in your fare. After your have gorged, the team will navigate the boat down the west coast of St Martin, past the beautiful red rock cliffs of Bay Rouge and the expansive and extravagant mansions that scatter Terre Basse (Lowlands). Here we will stop for a dip in the turquoise waters of Long Bay and relax on the peaceful secluded white sandy beach. Another great option available is to swim in the gorgeous crystal clear waters of Mullet Bay Beach, just over the border on the Dutch side. Towards the end of the tour, your speedboat will drift just off the world famous, Maho Beach. Here you will have an amazing opportunity to see enormous airplanes landing just overhead onto Princess Juliana International Airport. Your day will conclude with a short speedy cruise back to your same pick-up marina. 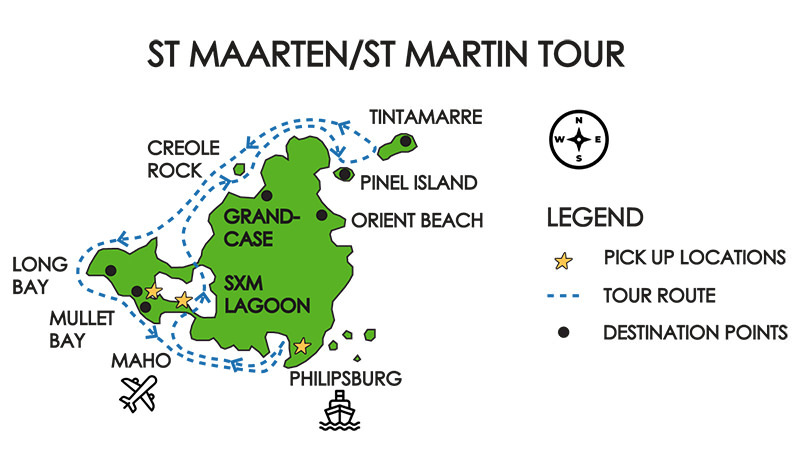 This itinerary will showcase the best boating locations that St Maarten and St Martin have to offer. Wining, dining, snorkeling, fun and relaxation all included. The tour duration will be approximately 6 hours. There is a possibility of cancellation after confirmation if there are not enough passengers to meet the minimum. In the event of this occurring, you will be offered an alternative or full refund. Chesterfields Marina, Philipsburg (Approximately 5-minute walk from Cruise ship terminal). After all is confirmed we will need a 20% deposit of your total to secure your spot. Balance can be paid on the day of tour before your departure, by either cash or all accpeted credit cards, except American Express. The full deposit will be returned if cancelation is made at least 3 days before the confirmed date. If cancelation occurs within 3 days, the deposit is forfeited. Full refund will be returned if your cruise ship arrives late or if it does not come into port at all. Full refund will be returned if our captain decides that the weather or sea conditions are not safe and enjoyable for the day. See why Anguilla has been voted the number one island in the Caribbean for travel and leisure in 2018. Cruise through the turquoise coastline and discover 5-star white sand beaches on this 6-hour tour. Explore the reefs and underwater life at sensational snorkeling spots and enjoy an included dining experience at a gorgeous beach side restaurant. Meet with your friendly Captain and Crew. 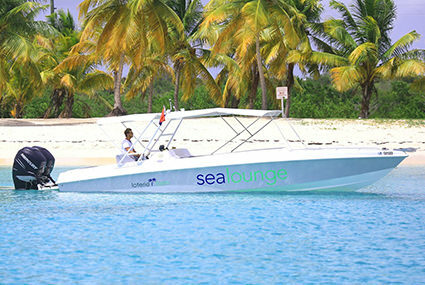 Cruise through the largest lagoon in the Caribbean and out of the French bridge in Sandy Ground. The crew will plug in a personalised playlist to sit back and enjoy the 25-minute crossing to the turquoise waters of Anguilla. Enjoy a refreshment at any time from the onboard open bar. First stop is at one of Anguilla’s most well-known, white sand beaches, Cap Juluca. Not only famous for its white sand and turquoise waters, it is also the beach of the five-star luxury resort owned by Belmond Group. Next we will visit Sandy Island. The name says it all, a sandy island about 1 mile west from main land Anguilla, surrounded by reef. This is the perfect spot for snorkeling and swimming in the pristine calm waters. From there a short cruise to the majestic cove of Little Bay also known as Crocus awaits. Beautiful known for its big cliff faces and an abundance of under water life. After an active morning of sight-seeing, swimming and snorkeling, lunch will be waiting at Da Vida’s Beach Side Grill. A delicious menu that offers scrumptious beach classics such as, burgers, wraps, sandwiches, salads and more. After gorging, relax on Da Vida’s gorgeous beach. Make use of the beach chairs, soak in the sun, views and perhaps rum punch all at once. From there we set out for Shoal Bay. An amazing white sand beach completely protected by reef. This will give the mind and soul the ultimate Caribbean feeling. For your cruise back to St Martin you will cross to the south west point of the island and possibly make a stop at St Martin’s most exclusive beach and hotel for a last dip. 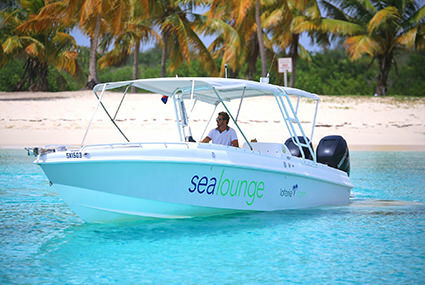 Your day will conclude with a short speedy cruise back to your same pick-up marina. 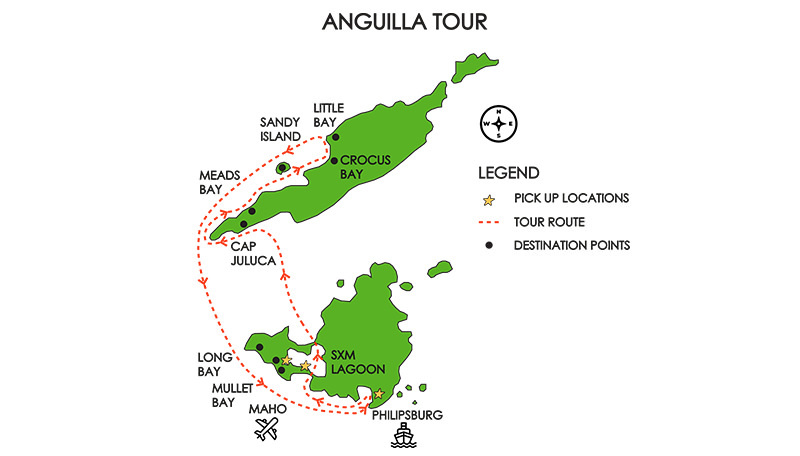 For this Anguilla speed boat tour, we have selected what we believe is the best itinerary that shows the pure beauty of Anguilla. The tour duration is approx. 6 hours. There is a possibility of cancellation after confirmation if there are not enough passengers to meet minimum. In the event of this occurring, you will be offered an alternative day or full refund.